PLOT: Documentary style account of a nuclear holocaust and its effect on the working class city of Sheffield, England; and the eventual long running effects of nuclear war on civilisation. During the height of the cold war in the early 1980s we were constantly made to fear for the future of the planet through government propaganda, public service films and general scaremongering. But nothing put the fear of nuclear war into such perspective as Threads. Told in part as a pseudo-documentary and part as a straight drama it chronicles escalating tensions between America and Russia, culminating in full on war and the use of nuclear weapons by both sides. Focusing on the local government emergency committee and two every day Sheffield families the film graphically depicts the brutal existence of the first few months following the attack where food is scarce, sickness is rife and hope all but disappeared. For a 1984 production and made on a relatively small budget (around £1/4m) the film is surprisingly realistic and effects are as good as you could expect. With a cast of mainly unknown actors (many who will later become soap opera regulars) the acting is par for the course and whilst it is not a classic in the Hollywood sense, it’s story and its very effective blending of public-service style infotainment with high drama make Threads stand out as probably the best of the 80’s nuclear war disaster movies and definitely the one that stayed with me the longest. 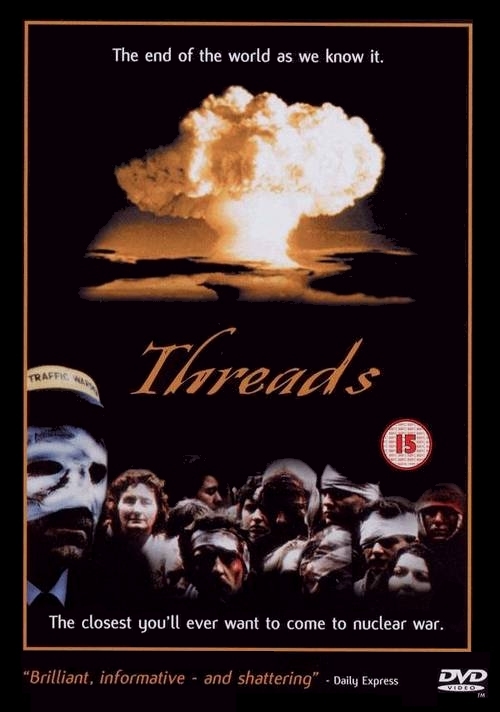 Whilst it is not a classic in the Hollywood sense, it’s story and its very effective blending of public-service style infotainment with high drama make Threads stand out as probably the best of the 80’s nuclear war disaster movies and definitely the one that stayed with me the longest.